To know everything about history! With BrainBox World History, children watch a card for 10 seconds and then answer a question indicated by the die. If the answer is correct, the card is won! 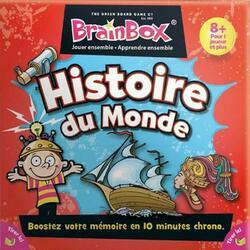 With this BrainBox, you will get to know many important events in the history of the world and France. Cleopatra, Napoleon Bonaparte or the Eiffel Tower will no longer have any secrets for you! A game of observation and memory accessible to the youngest. To develop children's knowledge of history. Contents of the box : 56 cards, 1 die, 1 rule of the game, 1 hourglass.